A walk down the supplement aisle of your local health food store can be daunting. There is an incredible array of choices, from the bottles claiming to boost your immune system to the capsules full of exotic herbs. Online, there are countless websites recommending dietary supplements to cure whatever ails you. And Americans are acting on these recommendations; the Food and Drug Administration (FDA) estimates they spent more than $36 billion on dietary supplements in 2014. But that walk down the supplements aisle is a little like a walk into the Wild West. Despite the claims and official-looking recommendations on those bottles, consumers have no guarantee that what they’re buying will do them any good. Supplement manufacturers face only relatively lax regulations from the FDA and aren’t required to prove that what they’re selling actually does anything. Congress defined dietary supplements, and the power the FDA has to regulate them, in 1994 with the Dietary Supplement Health and Education Act. Under the law, manufacturers can’t claim their product cures any disease and must prove the supplements were produced following a set of standards known as Good Manufacturing Practices. For dietary supplements that were on the market before 1994, the FDA just has to assume they’re safe. If an ingredient isn’t safe, the FDA must prove it is harmful before it can be taken off the market. Manufacturers aren’t required to standardize their products, so the amount of an active ingredient can vary from batch to batch. They also don’t have to prove their supplements are effective for treating any conditions. Navigating the supplement aisle may soon be easier and safer for consumers, thanks to academic researchers who are examining the safety and effectiveness of some of these dietary supplements. The National Institute of Health (NIH) launched its Botanical Research Centers Program in 1999 to fund supplement research. Their 2015 round of funding dedicates close to $35 million to labs across the country. Many women stopped hormone treatments for menopausal symptoms such as hot flashes after the NIH Women’s Health Initiative hormone therapy trials in the early 2000s found elevated risk of breast cancer and stroke. “Women started turning to alternatives like botanical dietary supplements,” says van Breemen. These supplements include red clover, hops, and black cohosh, a flower found in the Eastern U.S. Van Breemen’s team started looking at the safety of these botanical dietary supplements. “There’s concern that if you substitute one estrogen for another, you’ll have the same problems,” he says. To test the safety and effectiveness of black cohosh and red clover, van Breemen and his team take a stepwise approach. The team makes a standardized sample of a plant extract and then tests it in animals and humans. “We modeled these steps after how drugs are developed for human use,” says van Breemen. Their process is similar to how pharmaceutical companies prove to the FDA that a new drug is safe and effective. The results of their clinical trial were published in 2009. The hormone treatment prescribed by doctors proved most effective at relieving hot flashes in menopausal women, while red clover was nearly as effective as placebo. Black cohosh was only about half as effective as placebo. “Red clover does contain estrogenic compounds,” says van Breemen, so it was not surprising to find it had some kind of effect. But the black cohosh results suggest the herb is useless for relieving hot flashes. “We could not find an alternate mechanism for black cohosh, other than one that acts on the nervous system,” he says. 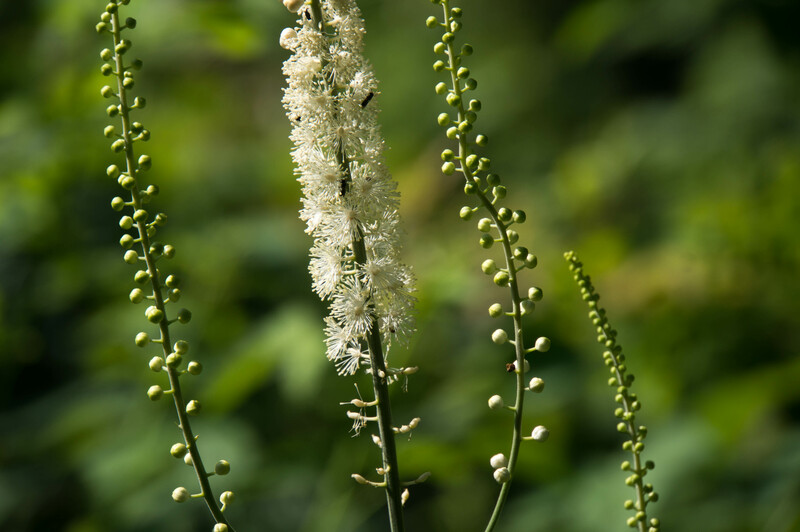 Black cohosh contains serotonin-like molecules that could have an effect on the nervous system, but van Breemen found there was a key roadblock. Those molecules “won’t reach the blood-brain barrier, they won’t even reach the bloodstream,” he says. This means the molecules won’t be able to reach the brain, so they won’t have any chance to have an effect on the nervous system. The NIH has also awarded funding to a new research center at the Icahn School of Medicine at Mount Sinai in New York. Led by Giulio Pasinetti and Richard Dixon, the new center will focus on how certain dietary supplements can help alleviate stress-induced depression and mood disorders. The team has already identified several compounds, called polyphenols, found in grapes and grape seeds that help the brain better handle stress. With the NIH funding, they will try to determine exactly how these compounds work in the body. Louisiana State University’s Botanical Dietary Supplements Research Center received NIH funds as well, to continue their work with botanical supplements for the prevention and treatment of obesity and diabetes. The center, established in 2005, has discovered several plant products, like a byproduct of sugarcane processing and a type of red lettuce, that may be effective for controlling glucose levels. The center is in the early stages of clinical trials to establish the safety of Russian tarragon for treatment of pre-diabetes. “We hope this research will advance scientific understanding that will lead to better design of future clinical studies and better-informed decisions by consumers,” says Barbara Sorkin, director of the NIH Centers for Advancing Research on Botanicals and Other Natural Products Program. Sorkin says determining how botanical products work in the human body helps researchers design better clinical trials to test supplements. While the NIH funds research on the effectiveness of dietary supplements, the findings generated by research centers may not make any difference in terms of policy. Wonderful. There could never be more need for finding effective and safe means to alleviate symptoms, than in menopause. When pharmaceutical products fail, our recourse is Mother Nature. It’s v cheering to see well -planned efforts at assessment of what Nature can offer, herein, and elsewhere in human ailment. I have 2 comments though; first, what is the sample size used in assessing liver toxicity of Black Cohosh? Second but as crucial, if efficacy is not achieved, why need safety assessment anyway; why waste money on it in the first place! That’s the reason that most professionals do not suggest a long term use of any supplement. As they get into the market through different process with drugs. Witt no scientific studies the effects both negative and positive are unknown. That will be good if they cause no side effects, except cause money wasting, and it will be a tragedy that any damages are led. Being natural doesn’t mean it’s good as it’s claimed. But it seems that there are few choice when we in such needs. May be the related regulation is a way out for this situation. There are actually vibrant discussions of science and nutrition for improved health if you know where to look. Since you see the doctor when you are sick, medical professionals traditionally ignore these research results because there is no fiscal interest for doctors in having healthy patients or in processes they can not prescribe. As a result, valid nutrition research often gets ignored and disparaged in the medical community. The medical business sees nutrition as competition and wants to make it smaller even though nutrition is a better and less costly treatment in some cases than anything medicine has to offer. Have a look at Life Extension Magazine which tries to have the most reputable scientists advise it on its publication and staff and their articles have a rich and long list of science research references. Yet it is also listed on many of the Quackwatch sites as “Nonrecommended Periodicals”. So there are undesirable opinions driving this process and the consumer can find benefit in good nutrition if they actually go, find, and read good analysis and research results from reputable scientists who are most likely objected to by orthodox promoters in the medical industry. For instance, there are vitamins for adults that take care of the body that is getting weaker by the day. And at the same time, there are also vitamins gummies for kids that help them grow faster and stronger. The age of the person is an important factor when it comes to choosing the right vitamin supplements.